Track Keyword Ranking with Mondovo’s Rank Tracker, unlike any other conventional Rank Tracking Tool. Monitor highest and lowest performing keywords across major search engines, language combinations, and 190 countries. Find out unknown competitors and overcome your biggest rivals with the most effective SEO strategies. Rank Tracker enables you to track keyword ranking in different Geographic Locations simply by toggling between tabs. Each tab has different useful charts like the number of keywords ranking in the first 100 positions, estimated traffic flow from your keywords, average ranking position of your website and an extensive Competitive Ranking Summary. The last tab displays a Consolidated View graphically showing both country-wise and competitor-wise statistics. Click-Through-Rate (CTR) and traffic flow. The Rank Tracker lists out the Top Performing keywords that have the highest search volume and are getting the highest traffic to your website. 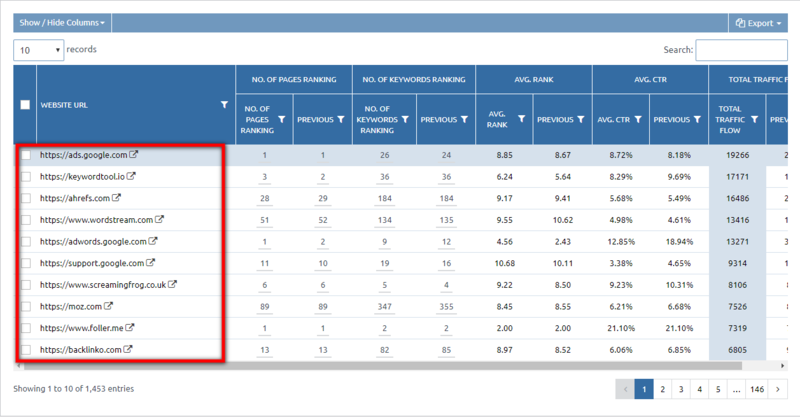 The Keyword Ranking table allows you to monitor search volume and current ranking of keywords against the competitors. It allows you to filter and customize table as per best performing keywords, biggest opportunities, top 10 and many other options. Furthermore, by clicking on each keyword, you can access an in-depth analysis of each keyword search volume, current rank, traffic flow, organic results, sponsored results, and other essential information that help to monitor keyword ranking. Imagine discovering a new keyword and competitor amidst the analysis and reporting! Mondovo Rank Tracker is so dynamic that it enables you to edit the existing tracker and lets you add new keywords and competitors. Once saved, it allows you to track all the real-time and current data including the newly fed information. Average website rank across all ranking keywords. Mondovo Rank Tracker is unlike any rank tracking tool for the amount of in-depth analysis it performs for every keyword used by you. Keyword Analyzer lists all the high impacting keywords found from the organic search results. It reveals the impact score, number of times these keywords appear in search and also, the number of URLs, titles and descriptions of each search rank tracking result. This table view can be sorted in descending to ascending or vice-versa as per the impact scores. Start your Trial of Mondovo today and keep an eye on your ranking progress.